Flatbread pizzas are a big craze, and this delightful one is a must-try! It features the Autumn Glory apple from Domex Superfresh Growers. This loaded flatbread will delight as an appetizer or dessert. For quick preparation, you can use 12 ounces of frozen pizza or bread dough instead of making the dough yourself. For the dough, stir together the flour and salt in a medium bowl, then make a well in the center. Pour the warm water into the well and stir in the yeast. Let sit until frothy, about 5 minutes. Stir together the wet and dry ingredients to form a cohesive dough. Knead the dough until smooth, 2 to 3 minutes, adding a bit more flour if needed. Put the dough in a lightly oiled bowl and turn it to coat with oil. Cover the bowl with a kitchen towel and set aside in a warm place until doubled in bulk, about 1 hour. Meanwhile, heat 2 tablespoons of the oil in a large skillet over medium heat, add the onion and cook, stirring occasionally, until translucent and partly tender, about 5 minutes. Season the onion lightly with salt and pepper. Cover the skillet, reduce the heat to medium-low, and cook until the onions are nicely browned and quite tender, 30 to 35 minutes longer, stirring occasionally. Set aside. Preheat the oven to 375 F. Lightly oil a rimmed baking sheet. Turn the risen dough out onto a lightly floured work surface and punch it down. Roll the dough into a rectangle about 10 by 14 inches; if the dough begins to spring back, let it rest for a few minutes before continuing to roll it out. Stir together the ricotta cheese, thyme, and a good pinch each of salt and pepper in a small bowl. Spread the ricotta over the dough, leaving a 3/4 inch border around the edge. Scatter the caramelized onion over the ricotta. Halve and core the apples, cutting each half into 1/8 inch slices. Arrange the slices over the base. Brush or drizzle the remaining 1 tablespoon of oil over the apples. 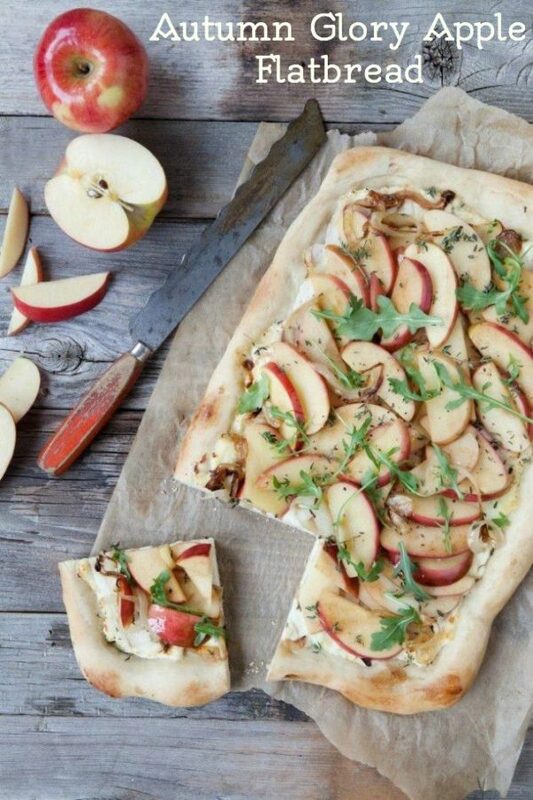 Bake the flatbread until the dough is lightly browned around the edges and the apples are tender, about 20-25 minutes. Let cool for a few minutes in the pan before scattering the arugula over and cutting into pieces to serve.